A super cool automotive-themed café, Driven is all about planning your next trip, renting cars and bikes, sipping on coffee, eating puffs and living the traveller life! A completely automobile-themed cafe on Residency Road, opposite the Gateway Hotel, Driven is our kind of cafe — chilled out and welcoming. Started by a Hyderabad-based company that focuses on self-drive or self-ride car rentals, and now even bike rentals, it’s perfect to meet to plan your next road trip. 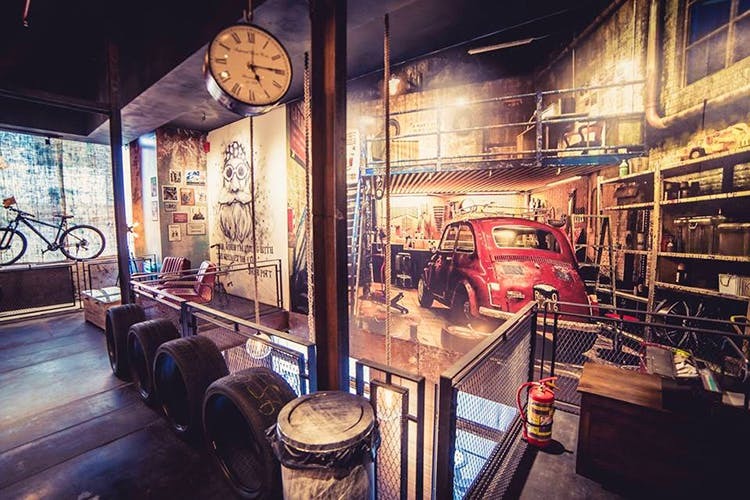 Much like the Hyderabad outlet, this Driven Café is mostly made of wood, with most of the décor looking like it’s come straight out of a garage – how rad is that! Think tyres, pedals at the base of table legs, chequered-flag table tops and walls painted with everything from old Volkswagons to automobile accessories. Plus, super cool photographs of bikes that look like they belong with Hell’s Angels, antique cars and bikes and intriguing route maps. And while we are tripping on the decor, the menu isn’t too bad either! So expect everything from Flat White and Turkish coffee to Illi Moka and Luwak. And since India runs on chai, there are many versions of that too. They even have that quintessential mountain-style tea that is poured out of a kettle. Inspired to ride off to Leh, aren’t you? Food is what you’d get typically on an Indian highway. We love the Cheese Maggi for its 90s vibes, the crumbly puffs because it’s really what you’ve packed on long drives and, of course, mini samosas. There’s also cheese balls, French fries, and garlic bread. If you’re looking to rent a car for your next adventure, make sure to look these folks up. From smaller cars like the Honda Jazz and Maruthi Swift to the Volvo V40 and Volkswagon Polo, they have it all. Prices for the cars start at INR 260 for two hours, or INR 2,550 for the whole day, with no restriction on the distance. Bikers, pick from the Aprilla or the KTM RC 390 for in town or outstation use.